One of Europe’s hottest destinations is Croatia’s Dalmatian Islands. Spend eight days hiking, beach-walking, and eating—without losing sight of the sparkling waters of the Adriatic Sea. Dalmatia is a slice of Croatian coastline with gorgeous islands just across the Adriatic Sea from Italy. Here, you’ll find some of Europe’s bluest, crystal-clear water; whitest sand and pebble beaches; and most elegant red-tile-roofed villages. With a history that dates back to antiquity—the Romans built villas on the sunny islands—this region is an up-and-coming foodie destination thanks to its fantastic local fare and outstanding wines. Dalmatian cuisine has similarities to Italian cooking, yet it’s earthier, with Hungarian and Slavic influences. And Croatia’s reputation for fine wines is growing. By the end of the trip, you’ll sing the praises of grape varietals like Plavac Mali, Teran, and Malvazija. 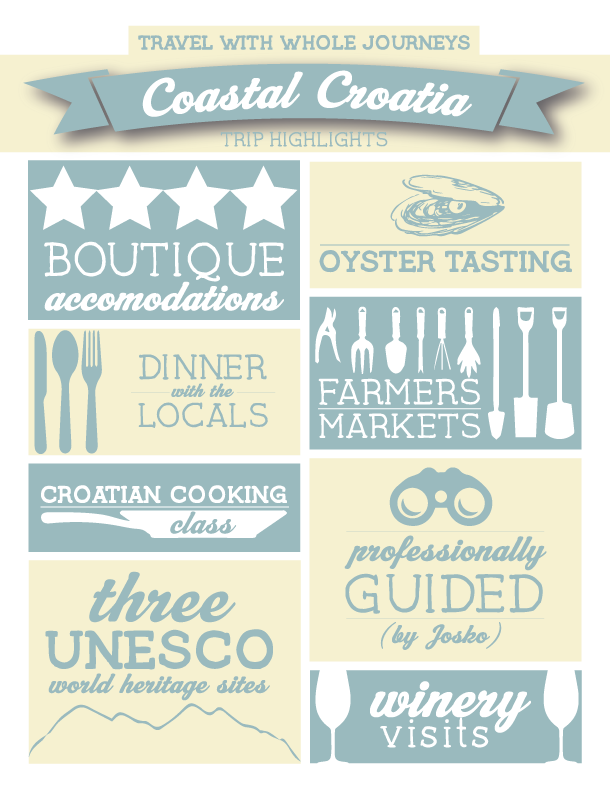 During this active foodie tour, you’ll get to know the real coastal Croatia: where the hikes are scenic and relaxed, the cooking is slow, and the island landscapes are unforgettable. 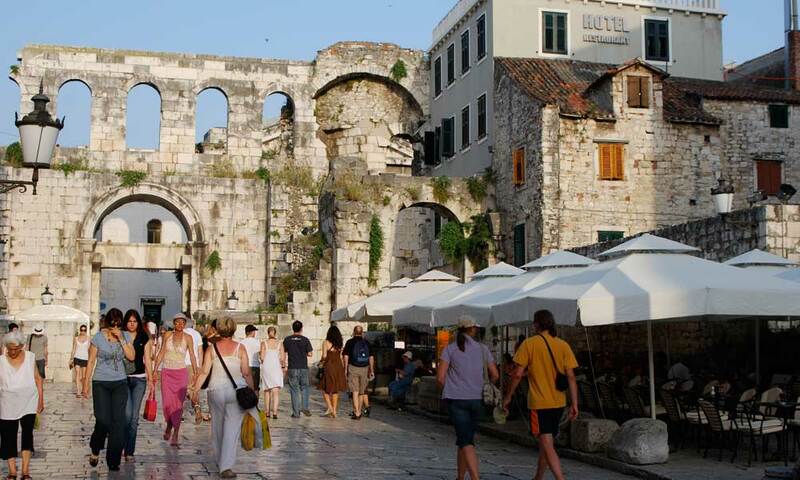 Our group meets mid-afternoon at our hotel in Split for a leisurely walking tour of this charming city (founded by the ancient Romans), including the historic streets of Diocletian’s Palace complex (a UNESCO World Heritage Site). We’ll start getting acquainted with Croatian cuisine during meals and our rambles through Split’s fish market and farmers’ market. Then we hop on a ferry to sunny Solta and spend a day exploring indigenous Dalmatian olive groves and an olive-oil mill that’s been in the family for four generations. We’ll sample the flavorful oils, of course, and taste Dobricic red wine, made from an ancient grape variety grown on Solta. Later, a beekeeper will show us how he produces rosemary honey using age-old methods. We’re back on the ferry—bound for the island of Brac, famous for its stone quarries, olive oil, lamb, and cheese. A highlight is our visit to the Stone Cutting School in Pucisca, to see the artisans at work. (Brac’s snow-white limestone was used to build the White House.) We’ll also hike from village to quaint village, and we’ll dine as the guests of a Brac family in their home. (Our meal might include pasticada, Dalmatian beef stew served with homemade gnocchi.) From the island’s highest overlook to Golden Horn—Croatia’s most gorgeous beach—we’ll marvel at the colorful coast. A catamaran takes us to the island of Hvar, where our sightseeing includes Hvar town’s seaside Franciscan monastery and the Benedictine Convent, where the nuns make lace from agave thread (a UNESCO-protected art). We’ll also meet Hvar’s last fishnet maker. Over two days, we’ll hike through lavender terraces, olive orchards, fishing villages, and across Stari Grad Plain (a UNESCO World Heritage Site), with stops for picnics and optional swimming at sunny beaches. We’ll also have a cooking lesson at a private home, and dinner one night will feature peka, a traditional slow-cooked meat with potatoes and vegetables—all roasted for hours under a bell-covered iron dish immersed in hot coals. Before leaving Hvar, we’ll hike to the organic Plenkovic Winery, which grows the Plavac Mali variety of grape, among others. 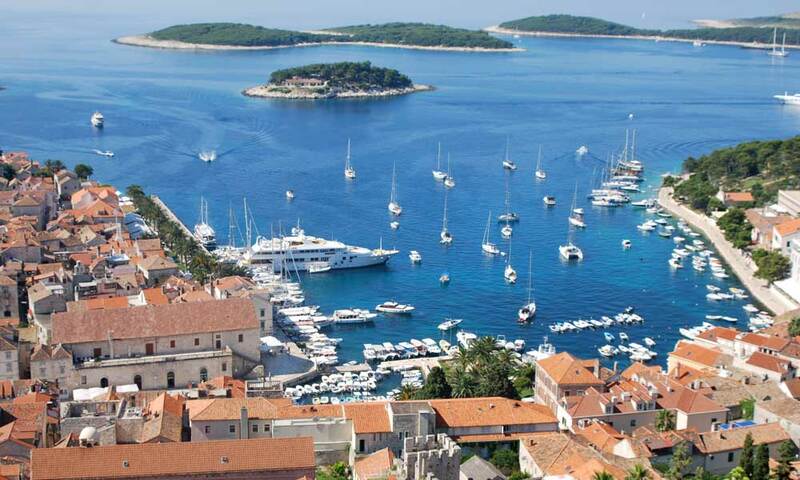 Then we’ll take a boat to Korcula, where Marco Polo was born. We’ll tour the town and taste the island’s unique Grk white wine, whose grapes were first grown by the Greeks in the fourth century BC. On Peljesac, a mainland peninsula right across the channel from Korcula, we’ll visit a Croatian truffle hunter and taste the flavorful fungus. We’ll also hike to a Franciscan monastery with panoramic views of the Adriatic islands, and we’ll peruse Orebic’s Maritime Museum. For our final group dinner, we’ll celebrate on Korcula in the village of Zrnovo with a Croatian feast of handmade Zrnovo macaroni and spit-roasted lamb. While we eat, we’ll hear traditional Dalmatian a cappella singers performing klapa music. Culinary adventures await even on our final day. We’ll enjoy a special tasting of the Peljesac Peninsula’s local wine and fresh oysters during our winery lunch. Then we’ll wander through the fortified medieval town of Ston, which boasts the longest walls in Europe: 3.5 miles worth. The walls were built to defend the salt basins, and salt is still harvested from the Adriatic in the traditional manner. By mid- or late-afternoon, we’ll arrive in Dubrovnik and drop you off at your hotel. (Your accommodations and dinner in Dubrovnik are not included in the trip price.) If you wish, you may join us for a city tour of Dubrovnik in the early evening (included). After that, we bid our travel friends a fond farewell: Svida oprostaj!